Wade Henderson is the President and CEO of The Leadership Conference on Civil and Human Rights, a coalition of more than 200 national civil rights and human rights organizations. The long-overdue passage of the federal transportation bill attracted bipartisan congressional support, but it was not the hallmark legislative advancement for civil and human rights that it could have been. Still, the work that led up to the bill’s passage proved to be a small but significant step for our movement and one that establishes a pathway toward achieving greater transportation equity when the bill is reauthorized in 2014. This current Congress is the most hyperpartisan and least productive that I’ve seen in decades. But with billions of dollars and millions of jobs at stake, passage of a transportation bill was an imperative, particularly since it was coupled with an important measure to keep interest rates on student loans from doubling. Some considered our work on transportation policy a bit unusual, but it is actually a natural extension the civil and human rights movement’s founding principles. Historically, transportation has played a key role in the struggle for equality – be it in the Montgomery Bus Boycott against segregated transit or in the fight against displacement of poor communities by interstate highways – because we’ve understood how mobility can affect our economic future. Then, as now, we had a lot at stake in this debate. Decisions about transportation investment have often excluded or inadequately addressed the needs of low-income people, people of color, people with disabilities, seniors, and many people in rural areas, resulting in policies that don’t benefit all populations equitably. About 560,000 people with disabilities are housebound due to transportation difficulties. And low-income communities, people with disabilities, and communities of color are less likely than other communities to have equitable access to transportation, making it harder for them to get to work or access schools, hospitals, and grocery stores. The financial meltdown and the slow economic recovery have also wreaked havoc on many of the nation’s affordable and job-creating public transit systems. Since 2010, 79 percent of transit agencies have made or considered service cuts, fare increases, or both. Given these realities, civil and human rights advocates had to lobby for more equity. We wrote articles and reports, held forums in Washington and across the country, and visited our representatives in Congress to urge them to support the right policies. I’m proud to say that we had some victories. The final bill provides funding for research into the disparities of transportation access. It funds grants to enhance the mobility of seniors and people with disabilities. And it maintains resources for on-the-job training. But we need to do more if our nation is to make affordable transportation access a reality for all. We’ve learned a lot about how vital the civil and human rights community was to this success, ensuring that we will have a seat at the table when this legislation is up for reauthorization in 2014. The next reauthorization must contain adequate protections from transit service cuts, provide disadvantaged workers with robust career pathways into employment in the sector, ensure the involvement of disadvantaged communities in local decision-making, and guard against lapses in civil rights safeguards. This is indicative of the work of the civil and human rights movement of the 21st century. 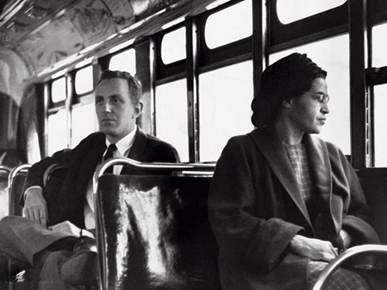 It may not make the same headlines of the Montgomery Bus Boycott. But those who follow our movement know that it’s never really been about headlines. It’s always been about jobs, education, and the chance to achieve the American Dream. Thank you for your work on this. Add the number of boomers aging over the next 20 years and the need for public transportation options is critical.